Russian planes once again rose above the Baltic to intercept the next American “stranger”. On Thursday, March 21, the Ministry of Defense published footage of the interception of the US aircraft. If earlier our Su-27 drove away unarmed reconnaissance aircraft, then this time the Russian fighters had to deal with the B-52N strategic bomber. And, as can be seen in the frames of interception, he carried on board missiles and bombs. With the help of experts “MK” tried to figure out what the goal was pursued by an armed strategic bomber of the US Army near our borders. On the video published by the Ministry of Defense, it is perfectly recognizable that the US bomber under the wings carries a container with a high-precision search-and-aim complex Lockheed Martin AN / AAQ-33 Sniper Advanced Targeting Pod. In addition, several bombs are visible. 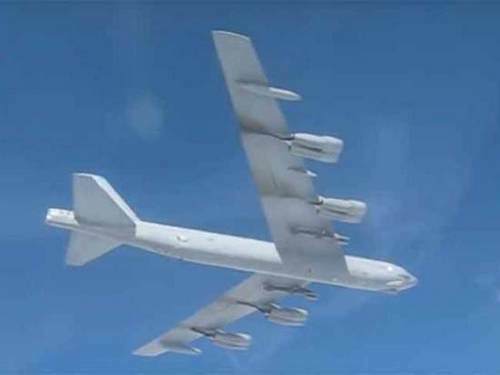 But what did the huge B-52H strategic bomber with such weapons on board near our borders do? The experts of MK are unanimous in their opinion: this is a typical demonstration of force in the USA. “The Americans decided to show the whole world that they can, if they wish, fly to Petersburg,” says military expert Oleg Zheltonozhko. – And this demonstration is also directed at its European minions such as the Poles, the Baltic countries and the Swedes. With this supposedly daring approach they show them: we are strong! In addition, the bomber type B-52H for a real strike does not necessarily fly up close to our borders. – States are well aware that in the Baltic we have a dense barrier of S-300 and S-400 – a radius of up to 500 km is unapproachable! And if they really were eager to hit us, they would easily have done it outside the scope of our air defense. But to try, as they say, to “touch” our frontier and defense is their true goal. “I am sure that during such a demonstrative flight of the B-52N to our Baltic borders somewhere in Poland, a drone was hanging and“ spotting ”our air defense in the same Kaliningrad,” suggests military expert Alexei Leonkov. On the other hand, such actions are worrying – there is an accumulation of aviation on the approaches to the Russian border. It is not excluded, there will be more such “zaletov”, and the technique – “fatter”.